FORT BONIFACIO, Taguig City – The new Chief of Staff of the Armed Forces of the Philippines, Lt Gen Gregorio Pio Catapang Jr., visited the Philippine Army on Thursday, July 24, a week after having been installed to lead the 125,000-strong armed forces. Lt Gen Catapang was welcomed by Army Chief Lt Gen Hernando DCA Iriberri, together with Army Officers, Enlisted Personnel, and civilian employees. In his talk with the force, Lt Gen Catapang emphasized the AFP’s major thrusts under his leadership and his priorities as the 45th AFP Chief of Staff. Lt Gen Catapang also underscored that in winning the peace, the AFP will likewise ensure progress and development. He said that the soldiers will closely coordinate with the local governments to help build “bridges for peace”, “schools for peace”, “hospitals for peace”, and “roads for peace”. 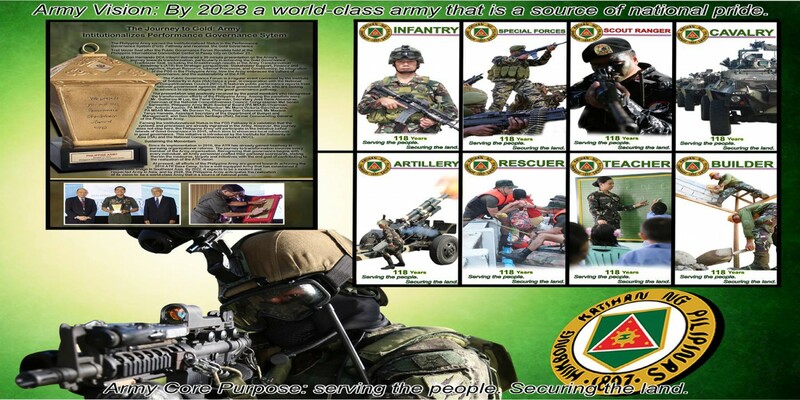 He added that Brigade Commanders shall identify projects in their respective localities that will benefit the populace, and the AFP will help the LGU carry out said projects. Also of paramount consideration under his leadership is enhancing humanitarian assistance and disaster response capabilities of the armed forces. Earlier in his command guidance, Lt Gen Catapang also laid emphasis on strengthening territorial defense, implementation of the AFP Modernization Program, and pursuing the AFP Transformation Roadmap. Lt Gen Catapang is the 45th Chief of Staff of the AFP. Prior to this, he was the 42nd Vice Chief of Staff of the AFP. He also commanded the AFP’s Northern Luzon Command, and was designated as Commander of the 7th Infantry Division. He is a member of the Philippine Military Academy (PMA) “Dimalupig” Class of 1981.